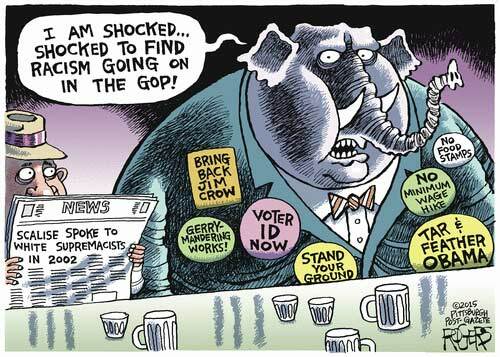 For decades, it has been apparent that the GOP is the party of xenophobia. Starting with Nixon, the GOP tied their electoral hopes to consolidating the white vote by demonizing and discriminating against African Americans (ex. mass criminalization, “welfare queen” rhetoric, etc. )—they called this the “Southern Strategy,” because they specifically designed it to attract the southern Dixie-Crats who had split from the Democrats over their support for civil rights. In more recent years, the GOP’s discriminatory tactics have shifted to primarily target Hispanics and Arabs, using the rhetoric of nationalism and national security as a weapon. While the xenophobia being pushed by the GOP is overtly toxic and damaging to those who are being demonized, a recent study suggests that it also may be hiding toxic consequences on white Americans that have previously been ignored. According to a new Princeton study, middle aged white Americans are dying at unusually high rates. 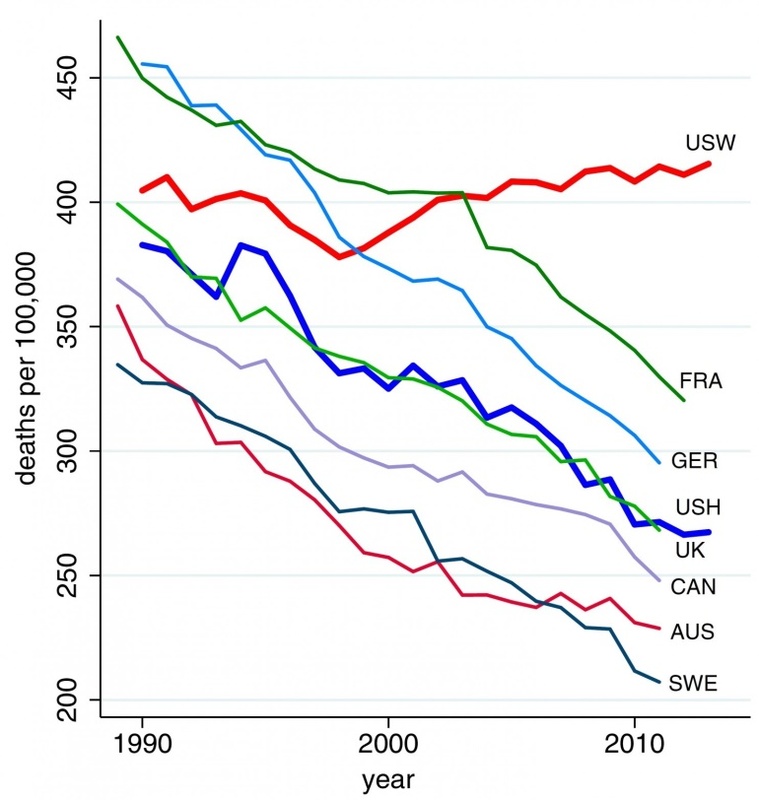 In contrast with other OECD nations—which have decreasing mortality rates—white Americans between the ages of 45 and 54 are dying at steadily increasing rates. These increases in the mortality rates are creating a widening gap between the USA and other nations that represent thousands of avoidable deaths every year. The researchers who conducted this study identified drug/alcohol overdoses, suicide, and long-term damage from alcoholism as the primary drivers of these mortality increases. 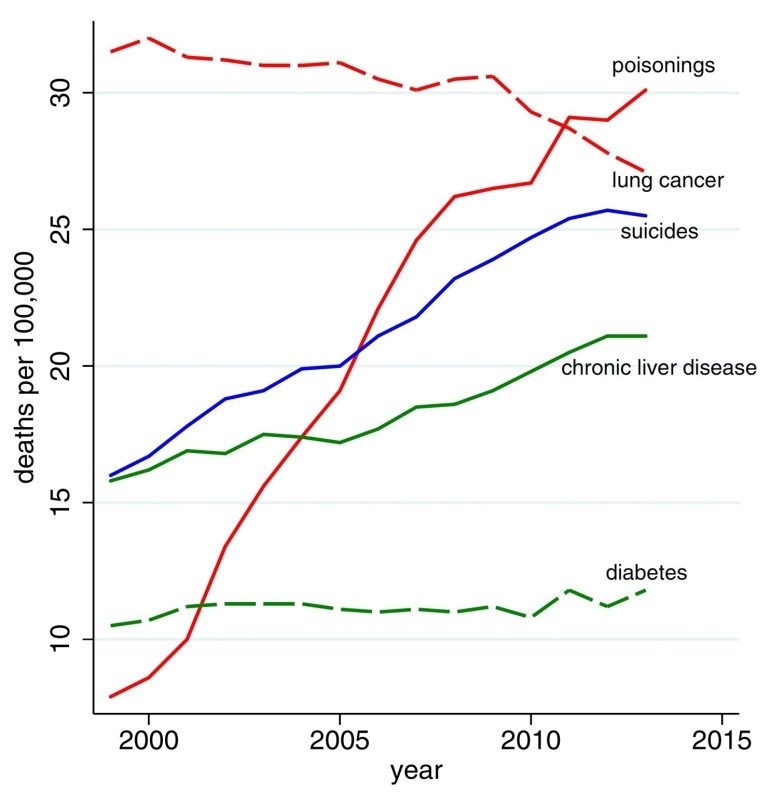 An increase in overdoses accounts for the largest increase in mortality (more than tripling from 1997 to 2013), while suicides and long-term alcohol damage have caused significant, but smaller, increases. The following graph illustrates the drivers identified in the study. Put simply, white Americans are self-destructing in ways that are not seen in other nations. This indicates that something has gone wrong in the USA that is not happening I the rest of the world. I theorize that this phenomenon is largely driven by the disastrous policies of the American right wing, and the unintended consequences of their policy platform. While the harms done to the white community by the right wing are not as overt or direct as the harms inflicted on minority communities and women, they appear to be significant in their own right. While it may seem counter-intuitive to blame the GOP—the party of whites and older people—for the problems facing middle age whites, there are actually some very compelling connections between right wing policies and the drivers of white mortality. First, the right wing obsession with deregulation, “free trade” and market uber-alles economics has brought about stagnated wages, decreased job benefits, and less job security. People have lost their jobs and those who have survived cuts are left being paid less, to do more. This has been made worse by decades of conservative anti-union policies that have eroded the job base that previously supported the American middle class. The reason why these GOP policies are harming whites more than other racial groups is simply a function of whites holding the jobs that are most likely to be affected at higher rates (a function of racism from the last generation). Put simply, whites made up a majority of the middle class, thus the GOP’s attacks on the middle class have affected whites disproportionately. Economic deprivation and hopelessness breed substance abuse, depression and other mental problems. These problems have exerted their lethality on older whites through alcoholism and substance abuse. As people reach the latter half of their career, with nothing to show for their hard work but debt and depression, they are more likely to develop self-destructive behaviors than if they were in better citcumstances. Second, the GOP’s opposition to universal healthcare has reduced the accessibility of care, making it harder, and more onerous to get care for chronic conditions in the USA than in the rest of the developed world. Because of the GOP’s recalcitrance on this issue, people with chronic mental health or medical conditions (ex. liver disease) are less likely to get care, thus more likely to die of conditions that they would receive treatment for in nations like France. One thing that supports this hypothesis is the lag in death rates following 2010, when the Affordable Care Act was passed. The ACA removed some of the barriers to care (ex. pre-existing condition bans, recession, etc. ), thus would have mitigated the lethality of some of these drivers of mortality. According to a recent Harvard study, as many as 17,104 Americans die every year due to a lack of medical care in the 25 states that have refused to implement ObamaCare Medicaid expansions. This study also concludes that 712,037 Americans with depression do not receive treatment because of this refusal. It is undeniable that many of these Americans who lack treatment for their depression due to GOP politicking are among those who self-medicate and drink themselves to death. These numbers would be even starker if the GOP had managed to completely kill the ACA. At the end of the day, the GOP has helped create the poverty and depression facing the middle class, then has done everything in its power to prevent sick Americans from accessing affordable care. These facts are undeniable, and the only real question is whether or not they are causally related to the recent increase in white mortality. Stark and horrifying isn’t it? They are killing their own base. They are counting on their base being too stupid to realize this and to raise a generation of greedy religious extremists to replace the people who are dying. When all else fails, they also cheat with voter disenfranchisement and redistricting efforts. What’s with the extreme increase in poisonings? Are these suicide related poisonings, accidental poisonings or homicidal poisonings? Or all of the above?